Mr. and Mrs. Ivan Divens, members of the New Carlisle United Missionary Church, moved to Xenia in late 1956. They soon became concerned about the spiritual condition of their neighbors and asked Pastor Frank Riffell for assistance. On February 14, 1957, he met with a dozen people in the Divens home for a prayer meeting. These weekly meetings, continued with the people gathering in different homes. There was no building available in the immediate area and the Divens decided to build a garage on the back of their lot. By this time, some of the Ohio United Missionary District leaders became interested and felt they should give some assistance. They planned a two week Vacation Bible School. Using the District’s tent and seats and furniture from the campgrounds, they set it up on the Ackerman Place at the edge of the community they were trying to reach. Miss Naomi Hoke from New Carlisle was the director and the theme was “Pioneering for Christ!” Teachers and helpers from New Carlisle, Dayton, and Springfield Trinity United Missionary Church assisted. The average attendance was 91 and the highest attendance was 111. The first worship service was conducted in the Divens’ converted garage on August 18, 1957, with the Ohio District Superintendent, Harold Bowman, leading. There were twenty-five present. Rev. Bowman continued to serve this group until December 11, 1957, when Roger Osborn agreed to accept the responsibility. Roger had been granted a local conference license by the Fairborn United Missionary Church. The group realized if the work was to grow it would need more room and facilities than a converted garage could provide. Thus, on December 12, 1957, the joint meeting of the District Executive Board and District Trustees unanimously agreed to purchase the house at 418 Stewart Avenue in the Laynewood addition. A work crew under the leadership of Albert Botkin removed several partitions and made it more adaptable for a church ministry. The first service in the converted house was on January 5, 1958, with 63 present. The chapel was dedicated as a temporary place of worship. In June the conference stationed Rev. Eugene F. Donovan as pastor. The District subsidized the work. Rev. John Carroll came to be the pastor in 1959 and continued for four years. During this period the church made progress and the district sponsored the buying of the Nazarene Church building on the corner of Orange and Bellbrook Avenue. Also during this time a change in the personnel attending the services took place. Sam and Esther Hoke from New Carlisle felt led of the Lord to assist them; for several years they faithfully traveled back and forth and carried responsibilities in the church program. In June of 1968, the District was considering closing the work due to lack of support and interest. A layman in the Springfield United Missionary Church, Paul Beck, talked to a young couple in his church about the possibility of leading the congregation until a decision was made concerning the church. John & Connie Lockwood agreed to begin their ministry in July 1968. John became licensed by the District that same month. (Pastor John was ordained by the Missionary Church Denomination on May 15, 1983.) Through his leadership the church began to grow with lots of Sunday School contest, a large bus ministry, and a thriving Youth Program. In January 1974, the church began a remodeling project with new carpeting for the floors and new pews. The church continued to grow, and God was doing great things in the heart of the people that attended. On April 3, 1974, the massive tornado that struck Xenia destroyed the church buildings. The Lockwood’s (Pastor John, Connie, Tami, Shawn) and Susan DeHaven and her niece, Lisa Miller were in the church when the tornado hit and were miraculously preserved. The disaster drew the people together, and with the insurance money and the leadership of Pastor John, a new facility was built on land at 1020 Lower Bellbrook Road. It was dedicated to the Lord on June 29, 1975. 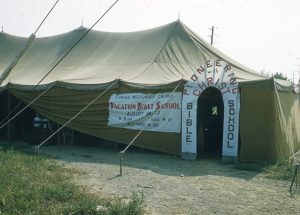 Through the years Bethel grew with a record attendance of over 700. Disaster hit again on the morning of January 17, 1989 with a devastating fire. With God’s faithful help and the determination of the Pastor Lockwood and the church family the facilities were rebuilt and dedicated again in October 1991. Many miracles were witnessed during this building program. In July of 2018, John and Connie Lockwood celebrated 50 years of ministry at Bethel Community Church. Only a few short weeks after this celebration, and after much planning and prayer, John and Connie Lockwood began a well deserved retirement. In a special service on Sunday morning , July 29, 2018, in front of past and present members, community leaders, family, friends, and a standing room only crowd of well wishers and people whose lives were forever impacted by their ministry, John and Connie Lockwood led one final service at Bethel Community Church. The history of this church could not be written without recognition of the incredible dedication, leadership, prayer, and direction of the Lockwood’s and their mission. The paragraphs above and those not yet written below were and will always be because of John and Connie Lockwood and their love for the community, the church, and the Lord. A Pastoral Selection Committee was formed and after an extensive search, Pastor Joshua Liming began his ministry at Bethel Community Church in October of 2018. Through the years, Bethel has been through triumphs and tragedies; highs and lows; but through it all God has provided a people, a place, and a pastor to keep the doors open and proclaim the Gospel of Jesus Christ to all who enter through her doors.